It pushes water off the palms and backs of your hands in one easy motion. No, it's not from Ronco - it's a Mitsubishi Electric design, until now available only in Japan. A "powerful gust measuring 90 meters per second" pushes the water down into a place where the excess moisture is captured. 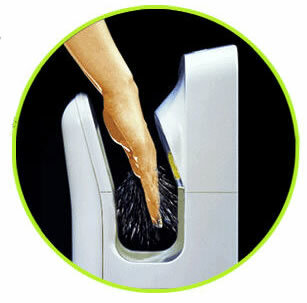 According to the manufacturer, it takes about 5 seconds to dry your hands, as opposed to the 30 seconds or more for conventional models. Believe it or not, the first mention of using a blast of air to dry your hands is found in Coventry, a 1940 story by Robert Heinlein. His air blast preceded the industry's first hand air dryer by at least 8 years. From Mitsubishi; found it in Red Ferret.